Simon Chan, a New Zealand-born scientist who went on to achieve great success in plant science in the US has died after developing complications while awaiting a liver transplant. Bart Janssen, Sciblogs reader and plant molecular and developmental biologist working at Plant and Food Research contributed the following tribute. One of the joys of being a scientist is occasionally you get to meet truly brilliant people. These are the people who see data differently, who make connections nobody else sees. They are inspirational people. And some are just genuinely nice as well. Simon Chan was one of those people, a genuinely nice person, passionate, excited about everyone’s work, fun to talk with. He was the kind of person who made you want to go back to the lab and do your best to excel. He made you happy to be a part of the community of scientists. I met him just twice. So what did he do that was so cool. Well he and his colleague, Ravi Maruthachalam (Simon took great pains to give complete and unreserved credit to Ravi when he spoke about his work) worked on CENH3. CENH3 is incorporated into the centromere, the piece in the centre of each chromosome that acts like a anchor point when the chromosomes get pulled apart as the cell divides, one set into each new cell. Simon and Ravi discovered that you could alter CENH3 so that it no longer worked as an anchor point. As a result when the cell divides each new cell gets an almost random mix of chromosomes. That’s very messy and generally a bad thing. Ok so that’s cool science and all. But what they then did was show that if you took two parents one with an altered CENH3 and one with a normal CENH3 and mated them, then the progeny lost some of the chromosomes from the altered parent and in some cases lost all the chromosomes from the altered parent. They had discovered a way of getting genes from only one parent into the progeny. This meant they’d made a haploid (half the chromosomes) plant. That plant still has all the genes needed to be a plant, but with just one set where most plants have two sets (diploid). And they could do it at will with pretty much any plant. world. 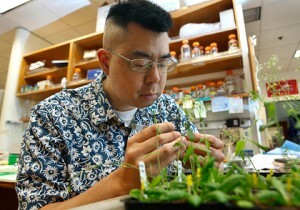 He received funding from the NSF and The Gates Foundation to pursue that work. They didn’t stop there and their work is still producing neat science. But importantly the work is being applied to the crops that feed the world. Simon Chan was a great New Zealander. Someone I hope schoolkids will hear about.